Although Isabey wished to become a sailor, his father, the miniaturist Jean-Baptiste Isabey, instructed him in art. He was enthralled by French Romantic painters such as Vernet and Delacroix and the British landscape painter Richard Parkes Bonington. Isabey grew proficient in depicting marine paintings with the storm-tossed boat. He was one of the first French artists to paint outdoors and has been seen as a source for the Impressionists’ work. 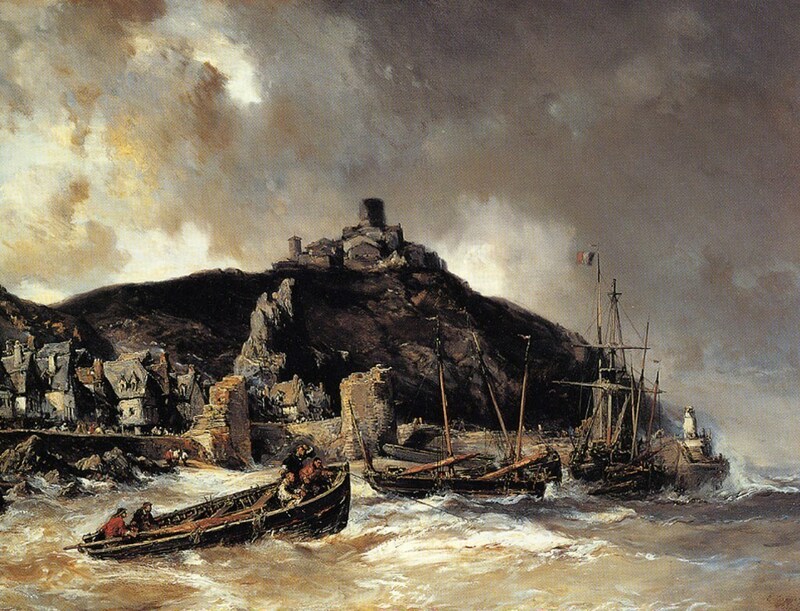 In this seascape, storm clouds build on the right half of the canvas, while sunlight shines on the fishing village at the left. The scene suggests a theme central to Romanticism: humans are powerless to halt the forces of nature.